"Evidence-Based Medicine is the integration of best research evidence with clinical expertise and patient values." When conducting EBP research on your topic or clinical question, it is important to consider the study methodology and corresponding quality of evidence that you find. 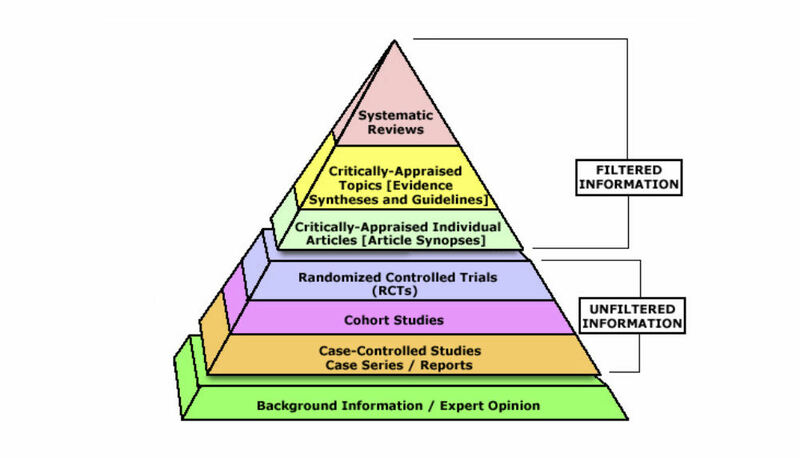 The pyramid below reflects the hierarchy of evidence in the medical and scientific literature. Scroll down the page to see which resources you can use to find the various types of studies and review articles listed in the pyramid. Simultaneously searches evidence-based sources of systematic reviews, practice guidelines, and critically-appraised topics and articles -- including most of those listed above and many more. Also searches MEDLINE's Clinical Queries, medical image databases, e-textbooks, and patient information leaflets. Full-text database containing structured abstracts of systematic reviews from a variety of medical journals. DARE is produced by the National Health Services' Centre for Reviews and Dissemination (NHS CRD) at the University of York. DARE records cover topics such as diagnosis, prevention, rehabilitation, screening, and treatment. Ovid MEDLINE: Enter your search query > click the Additional Limits icon > select Systematic Reviews. PubMed MEDLINE: Enter a search query > go to Article Types in the left-hand menu > select More... > select Systematic Reviews so that this option appears in the menu > select Systematic Reviews to filter your results. Or, from the main PubMed search screen, select "Clinical Queries" in the middle column > enter a search query > artices that are considered Systematic Reviews are listed in the center of the results page. A Web-based decision-support tool designed for rapid point-of-care delivery of up-to-date, evidence-based guidance for clinicians. Content is divided into five topic types (Diseases, Screening and Prevention, Complementary and Alternative Medicine, Ethical and Legal Issues, and Procedures) and includes strength-of-recommendation ratings based on the quality of the underlying evidence. From the American College of Physicians. Summarizes the current state of knowledge about the prevention and treatment of clinical conditions, based on thorough searches and appraisal of the literature. Describes the best available evidence from systematic reviews, RCTs, and observational studies where appropriate. A comprehensive database of evidence-based clinical practice guidelines and related documents produced by the Agency for Health Care Research and Quality, in partnership with the American Medical Association and the American Association of Health Plans. Updated weekly. Note: Guideline evidence varies from expert opinion to high levels of evidence. To limit your PubMed search to the best evidence-producing studies, click on "Clinical Queries" under PubMed Tools (in the middle column of the screen). This specialized search is intended for clinicians and has built-in search filters. Five study categories--therapy, diagnosis, etiology, prognosis, clinical prediction guides--are provided. You can also limit your search to various study types (systematic reviews, cohort, randomized controlled trials, etc.). From the PubMed search screen, enter a search query > go to Article Types in the left-hand menu > select More... > select the types of studies that wish to appear appear as optional filters on your results page. Limit your CINAHL search to the best evidence-producing studies by choosing various filters in the Search Options section of the page (e.g. select Evidence Based Practice, or choose a specific type of study from the Clinical Queries or Publication Type menus). Note: Evidence in these resources may vary from expert opinion to high levels of supported evidence. A clinical information resource, which offers up-to-date, fully referenced expert answers to patient-care, diagnosis, and treatment questions. Topic reviews are written by recognized authorities who review the topic, synthesize the evidence, summarize key findings, and provide specific recommendations. Physician authors and editors contribute to the eMedicine Clinical Knowledge Base, which contains articles on 7,000 diseases and disorders. The evidence-based content provides the latest practice guidelines in 62 medical specialties. eMedicine's professional content undergoes multiple levels of physician peer review. Use PICO to break down your clinical question into search terms for more effective database searching. Determine which type of study will provide the best answer to your research question. Evaluation worksheets from the Centre for Evidence-Based Medicine. A measurement tool to assess systematic reviews. Workshops, checklists, and other tools for critical appraisal. The Centre for Evidence-Based Medicine (Oxford) provides several resources that take you through the entire EBM process, from formulating questions to evaluating the literature to making informed clinical decisions.